This is a tough wagon, just look at the tires. They are not the tires on your typical kid's wagon. These are ten inch pneumatic tires with very good tread that will handle all terrains. 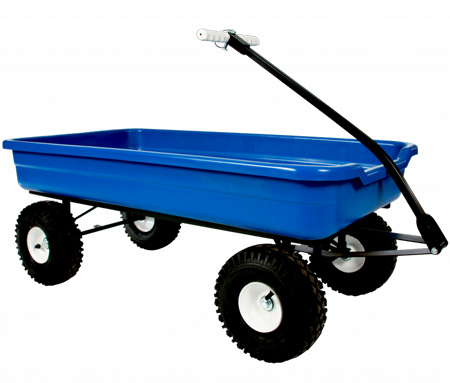 The Cruiser Wagon is designed to go anywhere and carry almost anything. It is especially recommended for transporting landscaping and planting materials at your home, the greenhouse or nursery. And of course you can treat your grandchildren for a ride as well. Frame/Base: Supports up to 1000 lbs. 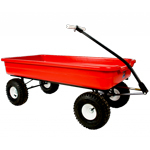 The interchangeable grip handle/tow hitch allows the wagon to be hitched to a tricycle or other wagons and lends itself to a variety of uses for both children and adults. Some assembly required - see packaging for instructions. 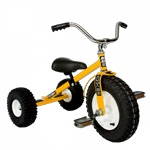 Dirt King Cruiser Cart is designed to hitch directly to your child's Dirt King Tricycle. 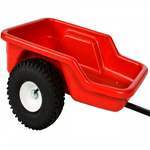 The Cart hitches to all Dirt King TRicycles.The cart will go anywhere the Dirt King Trike will go - over grass, gravel, mud and uneven pavement.